Light weight, yet still big enough to get the job done. This versatile, collapsible folding hand truck will fit neatly into small spaces for compact storage. Extra sturdy aluminum frame and decking give this truck the capacity to transport bulky loads with ease. 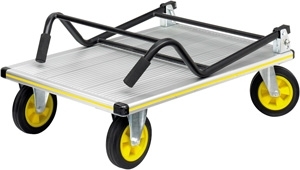 The StowAway Platform Truck has a quick-release mechanism to unfold the handle. The platform measures: 24"W x 35-1/4"D. The handle unfolds to 40-3/4"H working height. 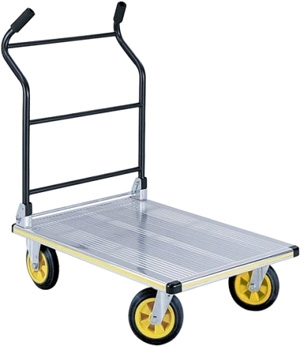 The StowAway Platform Truck also features 7" diameter solid rubber tires and 1000-pound capacity. Assembly is quick and easy and attaching the casters is the only assembly required. Extended size is 38-3/4 x 23-3/4 x 40-3/4".